Fun jewelry design elements that spark creativity in me to design my flirty accessory styles are everywhere. So I’ve made a list of all the different types of shiny beads, big buttons and cute charms that inspire me. These elements are my starting points in design and then new fun earrings, bold bracelets and colorful necklaces just start to happen without much effort. If the jewelry design I'm working on doesn’t fall into place easily even with these inspirational tips, I put it aside for awhile and that usually does the trick. See my previous blog posts on the creative process called Making Jewelry is Easy and Fun. Beaded Lucky Charm Necklace shown above has cute ladybug and dragonfly charms mingled between green and teal fire polished czech beads, then I added bright fun fashion buttons to complete the look. Handmade charm necklace has everything to make your style charming. Hollywood Glam Flower Bracelet on the left is a sophisticated bracelet that brings glamour back to special occasions like weddings, christmas parties, gala events and chic soirees. This bracelets is designed with ornate silver buttons, pretty red flower buttons and red fire polished czech beads. Unique handmade jewelry is art and I’m the canvas. What I look for in art and in earrings, bracelets, or necklaces is cool shapes, bold colors and fun textures combined to create a statement. How I combine my fun earrings, bold bracelets and colorful necklaces with clothing to achieve my look is unique to me. My closet and my jewelry box is my painter’s palette of self expression. To use your earrings, bracelets and necklaces to maximum effect, look for jewelry that makes a statement on it’s own. Beautiful drop earrings, charm style bracelets and plunging necklaces should entice you to keep looking, therefore when you wear it people will notice you too. Be a walking art gallery with bold colorful accessories that pop and get noticed for showing individuality with your fun glamorous jewelry choices wherever you go. Cheeky Charm Earrings shown above really stand out, because I used big shiny seashell charms hanging from pretty pink and deep plum fashion buttons. If you think people don’t notice you let these fun double button charm earrings highlight your stunning features. Fashion Star Earrings shown on the left have small beads hanging inside silver rings in this unique design. Buttons connected on each side of the rings make glamorous super long dangles. These trendy handmade earrings were created for fashion stars everywhere. What’s your individual style? Check out new jewelry designs and shop at www.flirtyfashionjewelry.etsy.com. Leaving unfinished jewelry design projects for another day doesn’t annoy me anymore, now it’s a creative tool I use. Fun time away from my new earring, bracelet and necklace designs lets my unconscious mind take over the creative process. 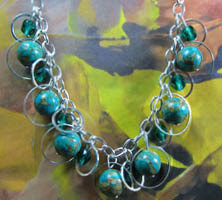 Then when I’m ready to get back to my handmade jewelry creations I am bubbling over with new ideas and fun solutions. Also with many cute jewelry creations on the go I can pick the earring, bracelet, or necklace designs I want to work on first, if one drop dangle earring style doesn’t inspire me the next earring design will. I never approached making jewelry this way before, but it feels great not to force the creative process. Now I can leave a colorful beaded bracelet half finished and the next time I look at it, the bracelet will just need a small design adjustment. In the past I would never leave a new jewelry style half finished, but I learned my approach was not conducive to great design. Now I’m constantly in the process of starting new earring designs while finishing other colorful bracelet creations, or fun necklace styles. Since I am not fighting the creative process many fresh jewelry design ideas start filling my head and I must hurry to make them a reality. If you liked reading about taking design breaks and having many jewelry design projects on the go, then check out my past blog on creative differences titled Making Jewelry With My Nieces. Chic Sweetheart Necklace shown above is made with gold flecked turquoise beads and faceted emerald green czech beads. Beads alternate in size inside silver rings adding dimension and drama, so original necklace has flattering draping design. Beautiful Destiny Bracelet shown above has deep purple flower buttons connected in a unique half twist design. Shiny accent beads seem to float above the buttons on silver connecting loops adding dimension. This Destiny Bracelet is enchanting with its delicate yet well made style. In my growing jewelry design studio I collect and combine a wide variety of beads, buttons and charms. For my unique jewelry line I use semi-precious gemstones, fire polished czech beads, antique buttons, bright fashion buttons and anything interesting I can find. I’m always searching for bold shapes and eye catching colourful patterns to inspire me. When I’m ready to create jewelry in my studio I make sure I have plenty of light and all my fun shiny buttons, beads and charms within easy reach. Then there are all my tools to bring out, I have so many different types of tools, that so far I don’t even use half of them. I’m a full-time artist, turning what I love into a business. I love getting bright new beads and buttons in my studio, the textures and variations in colour give me a beautiful bold pallet of choice. 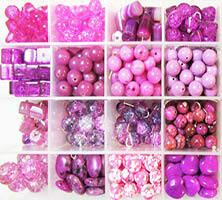 I buy my beads and buttons on-line and in local stores, but I also collect them from pre-loved clothing and jewelry. And then there are relatives from far away places who send me interesting shiny trinkets and gems from where they are too. Recently I’ve found I had no more room in my studio for all my wonderful beads, button and charms, so I’ve expanded. Now the rest of my home is literally a treasure trove of colourful semi-precious gemstones, fire polished czech beads and shiny antique buttons too. As I reorganize I see each day as an inspired adventure. It keeps Flirty Fashion Jewelry looking fresh, glamorous and original. Check out my shop at www.flirtyfashionjewelry.etsy.com.